If you are the loving owner of a pet such as a cat or dog it is quite possible that you have taken it on a journey in the car whether that is on holiday or to take it to the vet because it is ill. If that is the case, have you ever considered if there are any implications as far as your car insurance is concerned? Your pets must be suitably restrained when travelling in your car otherwise your car insurance company may not pay out in the event of an accident caused by your pet being unrestrained. Well, firstly, it may be worth looking at what the law says about taking pets in cars. A pet has to be restrained whilst in the vehicle to protect it against damaging itself or others or distracting the driver that could result in an accident. From a car insurance companies point of view, if you were involved in a road traffic accident and it was proven that your pet was partly responsible for causing the accident as a result of not being suitably restrained then the insurance company could refuse to meet any claim. Can you imagine the potential financial implications to you if this were the case? You could be held responsible for paying for any repair/replacement costs to the vehicles involved as well as damage to other property and be financially liable for injury or death to other people. So, it is important that, no matter how short the journey, that your pet is suitably restrained whilst in your vehicle. This could be by having a guard fitted in an estate car behind the rear seats so that the pet is kept within the confines of the boot. It could be by way of a seat belt harness, a cage or pet carrier. The cost of one of these sorts of restraints is not great and it will provide you with peace of mind in knowing that you are complying with the law, that your car insurance company will be happy and that your pet is less likely to be injured in the event of an accident. 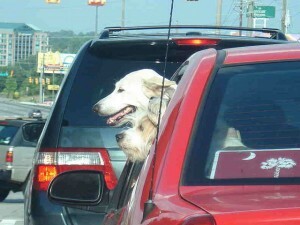 This entry was posted in News and tagged car, car insurance, Pets Travelling In Cars. Bookmark the permalink.